Example of a challenging Tooway Installation! Satellite Internet forum › TooWay and KA-SAT satellite › Example of a challenging Tooway Installation! 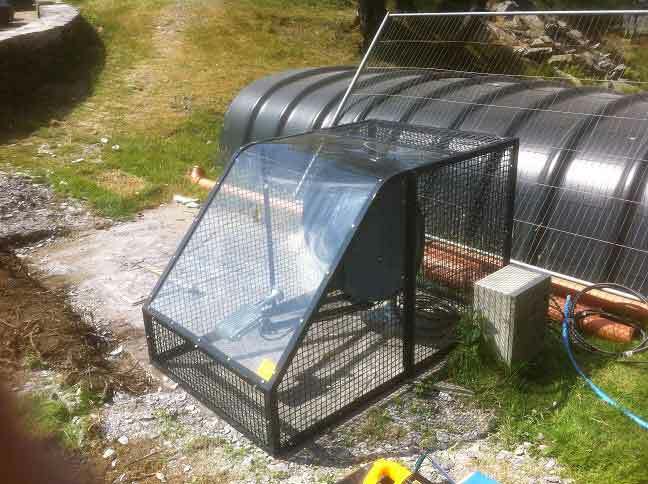 This July we installed a second Tooway system for The Snowdonia National Park at their new Warden�s office and visitor centre which has just opened beside Llyn Ogwen in North Wales. This new facility will include a caf�, interpretation room, toilets and offices for the wardens. With over 300,000 visitors coming to the area each year the new building aims to provide visitors with information about the area and serve as a base for the warden service who look after the Ogwen Valley. Installation of the system was challenging, as the building is overlooked by a cliff behind the property making it impossible to site the dish on the building. The only viable option therefore was to ground mount the dish across the road some eighty metres from the Centre. This posed a number of issues which needed to be addressed; firstly the advised limit of cabling for the Tooway system is about thirty metres, and we realised that the cable run was nearer ninety meteres in total! Also the dish would be in plain view to the public within an area of outstanding natural beauty. With our help the staff at the Park designed and built the cage which you see in the photo.� The front of the cage has a thick perspex semi-transparent canopy, the dish itself was also painted to blend in better with the background. This cage addresses two main issues; it makes the dish significantly less obtrusive and deals with the issue of public safety. For the extended cable run we tested a higher specification armoured cable on an existing Tooway system to see if there was any loss in sgnal quality before actually installing the cable underground between the Centre and the dish. Well I�m happy to say that the Tooway system is working like a dream delivering a download speed of 20 Mbps. It was a lot of extra effort but totally worthwhile. I�d like to wish the SNP the best of luck with their fabulous new visitor�s centre, and thank Nia and Dylan of the SNP for all their help on this project.